Facilities Services Development Group has submitted an offer to build a new administrative headquarters for the Miami Dade School Board. The company would design, privately finance and build a 16-story project with an estimated $71m construction cost. There would be about 150,000 square feet of Class B office space, 600 parking spaces, an auditorium and dining room, and ground floor retail and restaurant. The School Board would be able to consolidate and sell off their existing buildings. Revenue from the parking, retail and restaurant space would also offset the cost of the lease. 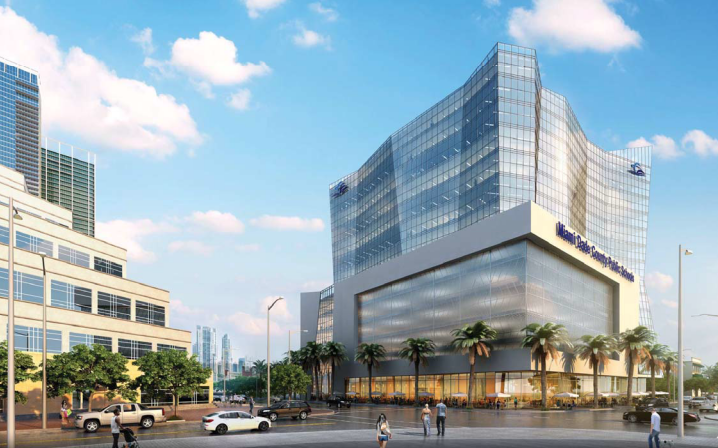 The proposal came in response to an RFP for land owned by the school district at 1370 Northeast 2nd Avenue, across from the Arsht Center. Miami developers Crescent Heights and Related Group both submitted competing bids. Zyscovich is the project architect, while Stiles would handle design-build, leasing, and property management. It’s beautiful and converses with the opera across the street. It would be a great addition to the neighborhood. Yes it does. It looks like an arts building. It’s certainly a good thing that there are now multiple bidders on this property. Hopefully it means a better result for the Schools and the people of Dade. Can’t wait to see all those empty, derelict filled, horrific wasteland parcels filled with buildings. I agree with this in principle. I won’t pretend to know the occupancy of Downtown area or Dade County schools. But I know most of the public schools are quite large. I’m also not entirely sure of how many new public school-aged children are moving downtown with all this new development and how those needs are being met. BUT, if that requires the Brickell elementary to be razed and build into a K-12 or the like, so be it. Or build the elementary into a larger K-6 and something in “Omni” as a 7-12. Incorporate them into the lower floors and build offices or residential above them to offset costs or to form PPPs. Whatever works best. Not enough schools. Thankfully there are charter schools that help fill the void left over by public schools. it’s amazing to me the thousands of teachers and students leaving public school system for charter and private schools and with many existing schools in disrepair, the schools board decides to build a palace for its bureaucrats. And bring more traffic to the already congested Down town area?I don’t think so. And bring more traffic to an already congested Down Town Area? I don’t think so. And the 16 story project for the prime piece of property,WOW. does anyone else have that slightly sick feeling looking at this ‘palace of bureaucracy’ meanwhile the actual public schools are complete garbage. no wonder charter schools outpace public schools. instead of building palaces for the bureaucrats how about schools that are not an embarrassment? Charter schools “outpace” public schools because they get to pick their students and because they get to steal public schools’ money. Why does the Opera need a new administrative building for a school board? There is no school affiliation to the opera and this is seems so pointless. Why not move the school board building for Dade County somewhere else within unincorporated Dade County? Then the sale is pure $$$ for the district. No need for a flashy admin building in that area…move it to Doral or elsewhere for a huge return on money. Don’t forget that people work in this building. Right now they have mass-transit options to get to work. If they move out to Doral or somewhere else suburban they will have to drive. Totally agree, besides, why should it move to unincorporated Dade County. Miami is the seat of the county and where all admin and gov’t buildings should be. When are we going to stop the suburbia madness? Who said they can’t put the new building near mass transit but outside the downtown core? I think the School Board should consider all options. Choose the best one, whatever it may be. Got it. They should move so we can have a tall condo building there. This is correct. No reason to have the school board there. They need to be next to a metro rail station somewhere out west. Not in the middle of high density zones and A/E central…. The school board just got a huge Loan (I mean bond money) … do they realize we have to pay all back? The better spend it fast!!! Betsy V. is coming for it! !